The pope is the Bishop of Rome and the only leader of the whole Catholic Church. He is also head of state of the Vatican City, the independent city–state, enclave of Rome. The history of Christianity and popes is very complex and long. 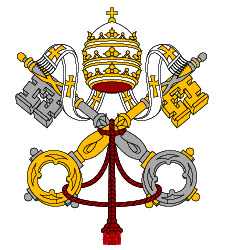 It is supposed that the pope is the successor of Saint Peter, though he never bore the title of the "Pope". There are a lot of precise information missing from this early period. According to some historians the fact that Peter was the first bishop of Rome and the founder of the Christian church couldn't be traced back earlier than the 3rd century. In the early Christian era, Rome and a few other cities had claims on the leadership of worldwide Christian church. The roots come from the Jerusalem church, which is still considered the "Mother Church" in the Orthodox tradition. Alexandria had been a center of Jewish learning and became a center of Christian learning. During the first century of the Christian Church (ca. 30–130), the Roman capital became recognized as a Christian center of exceptional importance, but there are very few references of that time to recognition of the authoritative primacy of the Roman See outside of Rome. With the conversion of Roman Emperor Constantine to Christianity and the First Council of Nicea (325), the Christian religion received imperial backing. At the time, Rome was still seen as the capital of the empire but soon after a new capital was established in Constantinople. That's when the period of rivalry had started. At the Council of Chalcedon in 451 the Bishop of Constantinople was given equal privileges to those of the Bishop of Rome, but Pope Leo rejected this decree. As the time passed by, the Empire started to weaken beside the Muslim expansion. Since the Emperor couldn't protect the papal estates, Pope Stephen II went to seek protection with the Franks. Later on when Leo III crowned Charlemagne (800), he established the precedent that no man would be emperor without anointment by a pope. Around 850s started a period of a series of falsifications of past legislation, now known as the False Decretals. The principal aim was to free the church and the bishops from interference by the state. Pope Nicholas I asserted that the pope should have authority over all Christians in matters of faith and morals. The authority of the papacy was acknowledged more widely than ever before. But these centuries were the period of strong turbulencies and power oscillations. In the period from 867–1049 the Papacy was very weak and politically controlled. Popes were imprisoned, killed and deposed by force. Conflicts between the Emperor and the Papacy continued. 1054 is the year when the East and the West churches finally split. The reason was of mostly political character. They respectively became the Eastern Orthodox Church and the Roman Catholic Church. The period of struggle didn't end here. With the arrival of the Middle Ages, popes fought a lot with monarchs over power. From 1309 to 1377 the pope's residency was not in Rome, but in Avignon. The Avignon Papacy was known for greed and corruption. The Western Schism (1378–1417), was a split within the Roman Catholic Church and two men claimed simultaneously to be the real pope. The schism was ended by the Council of Constance (1414–1418). The Council elected pope Martin V, ensuring the legitimacy of the Roman line. As the ages passed by, popes gradually gave up the secular power and focused on spiritual issues. The period between 1861 and 1929 is known as the "Roman Question". It was the political struggle between the new born Italy and the Papacy. In 1870, when Rome fell down and the Unification of Italy was finished, the Pope lost all of the territories of his great Papal States. The "Roman Question" was finally settled in 1929 with the Lateran Treaty between Italy and Pope Pius XI, which established the Vatican city and guaranteed papal independence from secular rule. The election of the pope almost always takes place in the Sistine Chapel, in a sequestered meeting called a "conclave". The cardinals are locked in until they elect a new pope. The results of a ballot are announced to the world by a smoke that goes out of the Sistine Chapel. Once the ballots are counted they are burned in a special stove. The ballots from an unsuccessful vote are burned along with a chemical compound so that it could produce black smoke. When a vote is successful, the ballots are burned alone, and the white smoke goes out through the chimney announcing that the new pope has been elected. 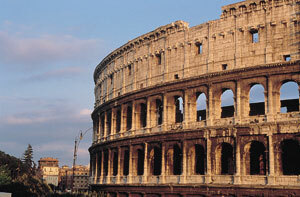 Explore Christian Rome as you travel to places such as Esquiline Hill and the Basilica of Santa Maria Maggiore. See the Holy Staircase, the Lateran Palace, the Basilica of San Giovanni and the cathedral of Rome. Visit the Catacombs - the ancient underground cemeteries and first hiding places for the Christians. The "Pope" is maybe the best known title, but it does not appear in the official list.